6.90 points at 10 votes (rank 375). 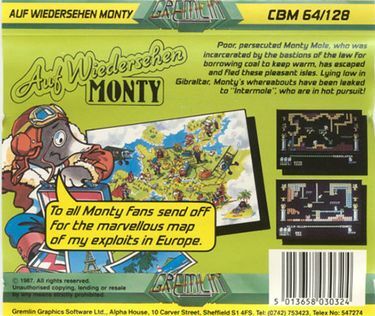 Auf Wiedersehen Monty is a multi-screen platformer by Gremlin Graphics from 1987. 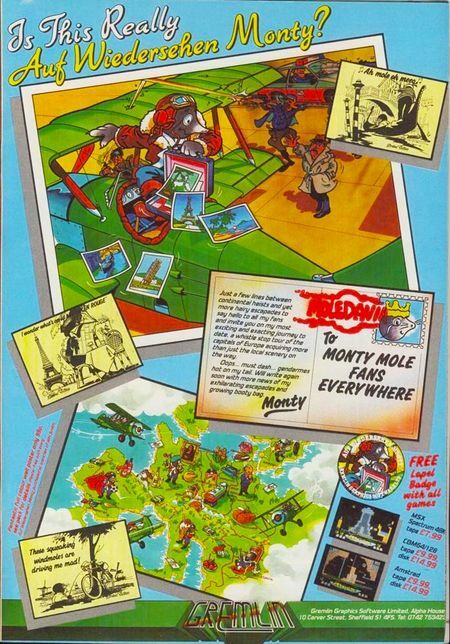 It is the third part of the series of four parts around the hero Monty Mole, a mole that is searched by the law and was originally in prison due to coal theft but broke out and since then is permanently on the run. In this part of the series the player needs to steer Monty through half of Europe - the iron curtain had not yet opened in 1987 - and collect enough money to be able to buy the isolated island "Montos" (between Lesbos, Mentos and Domestos) and by this permanently evade custody from his followers. To get the necessary money for this, Monty has to collect the 180 traveller's cheques which are scattered in the numerous screens, as well as the valuables that he can convert into cash at certain places. His travels lead him starting from Gibraltar over almost a hundred screens through Spain, France, Germany etc. but also through fantasy countries as "Moledavia" or "Austria". Monty can use airports to shorten his travel distances but he needs tickets that must be collected beforehand. But as Monty can only carry four valuables or tickets at the same time (damn balloon pants!) he has to plan his route well to avoid unnecessary ways and use the limited tickets as economically as possible. As already in the previous game Monty on the Run the kleptomaniac mole has to face the different types of enemies that are sometimes motionless, sometimes moving on regular paths, in each screen as well as hard to reach platforms and other types of terrain with unexpected features. 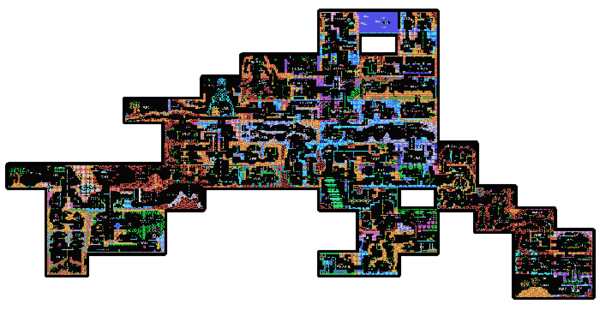 The more money Monty can collect, the more of the graphics of his longed for paradise island is uncovered in the lowert part of the screen. But only when he has obtained the necessary 18.000 "money", he can finally withdraw there and enjoy "the good life". Spain: The land of tennis ball trees, tree rabbits and majestically circling sausage buns. 'Ello, 'ello, Monsieur Toulouse-Lautrec, you 'ave a mighty 'at! P.S. : at the upper right a secret door! On his tour through France Monty simply climbs the Eiffel Tower...incroyable! As already with the forerunner, Monty on the Run, the well-tried Spectrum graphics is dished up anew, which means: HiRes as far as possible on black background. If you consider that almost two years have passed between MotR and this game, astonishingly little has changed concerning the graphics, you even have to search for the differences with the magnifier. This concerns the hopping ticker in the title screen which also uses the lower part of the screen and small decorations as the columns with the flower pots and the bowls for the items that frame the game area. Most striking is maybe also the downright wasteful use of animated, geometrical patterns, that have a mildly psychedelic effect as brightly coloured, rolling endless wallpapers. Monty's enemies are this time designed even crazier and appear in the shapes of crooked mutants, grimaces from hell, animated items, mythical creatures etc. (the list is endless...!). The hefty dose of surreality which is created by this, points significantly into the direction of genre benchmarks Manic Miner and Jet Set Willy. Rob Hubbard and Ben Daglish have shared the work of designing the title tune: Hubbard visited Daglish for two days at Gremlin Graphics and they created together a dramatic six-minute piece with oppressive intro and whining SID-"guitar", which came out to be significantly more linear and technoid as the ingame music for Monty on the Run. Hubbard added to the game also a dozen "national anthems", which are played when crossing the borders of the corresponding countries. It gets clear that he had a lot of fun in that, when you arrive in Sweden and the "Smørrebrød" song of the Muppet Show TV cook blares into your face or when the national hymn of the Netherlands "Tulips from Amsterdam" starts to play and is then choked off in a virtually ingenious manner. However, these can only be heard if you decide to turn off the music in the title screen, whereupon the game stays deadly slient except for the named hymns and some very few sound effects, that you almost startle as soon as the game makes a sound. Huge beer glasses in Dortmund induce frisky hopping around with fatal consequences. This is even like in real life! 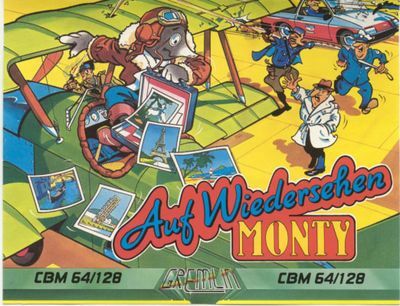 During the short flying sequence Monty can collect bonus points by sawing up the opponent's tail unit with the propeller blades. The music from Radio Luxemburg leads for Monty to a spontaneous cramp attack...let's get out of here! C= : redeem ticket at the airport : switch off music in the title screen and sound effects on. Als de lente komt dan stuur ik jou Rolmops met Pindasauce uit Amsterdam...lalalalalaaaaa! And afterwards smoke a nice bag of coffee. 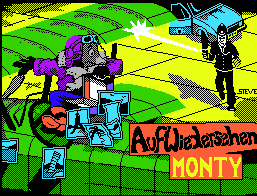 Dee Technik is a Hund: Some fun in "Dodgy Austria" with a surprisingly malfunctioning ski lift. At the Leaning Tower of Pisa Monty hands flowers to his beloved Julia and gets in exchange...money. Romance looks different, but 600 Money are also quite nice. The extremly reduced map for the game. A hugely big map can be found here. (Gibraltar) 75 points Bottle "Chateau Blanc"
(Amsterdam) 600 Money when giving to Julia, the "Mole fatale"
(Borg, Sweden) 1000 Money when delivered in "Monaco"
(Resort, Spain) 750 Money when delivered in "Juventus, Italy"
(2x) 104 points Image of "Gorbatschow"
Resort Spain Monty is trampled to death by a bull. These special plaftorms and walls can appear in different colours and slightly changed appearance. Monty takes swing for a high jump. Monty slides without control over the ice. These structures dissolve when touched. Better not jump on it! Very rare! Very hard to recognize! Very deadly! 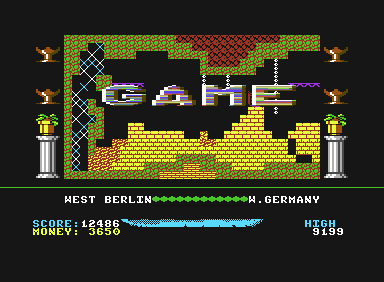 The game ends happily for Monty, when he has collected all the money-making items and left the screen "Harbour Greece" at the lower right on the map by a jump over the left screen border. Then you see him on his island Montos in company of an exciting woman in bikini while nonstop knocking back cocktails and after a few seconds the now well-accustomed GAME OVER will be faded in. Finally done...about time to get drunk! The version by Lucid & Tricycle has trainer options and an subsequently built-in highscore saver. Robotron2084: "I like Auf Wiedersehen Monty much better than the forerunner, because it is not so brutely linearly designed and the flying sequences mix up the game again and again. Also the music is in my opinion much more catchy than the nervous track in MotR, although I always switch it off to hear Hubbards sometims hilarious "national anthems". "O Tannenbaum" as recognizing melody for the Eastern Bloc, awesome! I also liked much better that you did not have to put together a silly Survival Kit without which you at some point in the game were not able to proceed, and this impression of the game stayed until today. The topic of a journey through Europe and the many cute country-specific details and sprites that fill the screen give the game a significantly more causual note. AWM is of course sometimes as unfair as MotR, which is on the main part caused by the still existing "crushers" in the game, which are unpredictable and which you need to avoid if you do not plan to play the game to the end, but there is nobody that crazy (or is there?). For all I care there could have been a further sequel in this style, but there wasn't, because for "Impossamole" were other paths chosen concerning the design. Together with Wizard and Impossible Mission is AWM at the very top of my top list of platformers and I give 8 out of 10 points." Enclosed to the game was a button which you could stick amongst others to the Lacoste polo shirt, to the ear or to the hat (or where the sun does not shine), to set a new course. 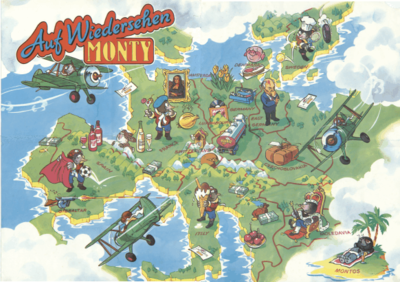 A request for for this comic poster that shows Monty on his escapades through Europe was also included in the game. 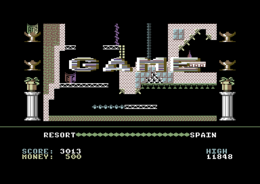 As the C64 version of the game - in contrast to the versions for ZX Spectrum and Amstrad CPC - did originally not contain a loading screen, DATA-LAND retrospectively created one for the game in February 2010. The HiRes graphic is a direct port of the loadings screen in the ZX Spectrum version. Unfortunately, there is no version of the game where the graphic was integrated. 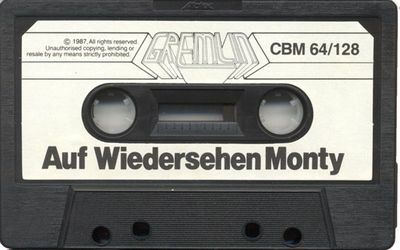 The title of the game is an allusion to the TV series "Auf Wiedersehen, Pet!" from the 80s by the British channel ITV, which is about the adventures of British foreign workers in Germany. For the title to be recognized by speakers of a dead and long forgotten language, the game was renamed in France to "Au revoir, Monty". Longplay through the game, but with sprite cheat...boo! This page was last modified on 31 January 2015, at 21:52.